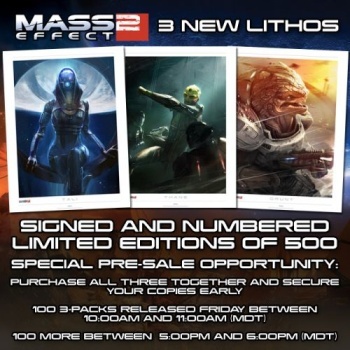 Deep-pocketed Mass Effect fans will want to check out these very pretty, very limited and very expensive lithographs of Tali, Thane and Grunt that begin pre-selling on Friday. This is one of those times in life when we separate the men from the boys. Lots of you are Mass Effect fans - so am I - but how many of you are willing to blow more than 100 bucks on some fancy-shmancy pictures of the crew? Make no mistake, these pictures are fancy-shmancy. Each lithograph of Tali'Zorah vas Normandy, Thane Krios and Grunt will be signed and numbered by the artist who created it, and only 500 of each will be printed. Because of complaints that previous lithograph offers sold out before some fans were even aware of them, BioWare is giving everyone a heads-up now so they can be ready for it. Two "pre-sales" of 100 packs of all three lithographs will be offered this Friday, October 29, the first between 10 am and 11 am Mountain Daylight Time, and the second between 5 pm and 6 pm MDT. Each pack will sell for $120 and whatever's left over after the pre-sale will be available for purchase individually through the BioWare store later in November. 120 bucks is a lot of coin, but these lithographs are a lot of awesome. The Tali image is particularly striking, although as a character the only one of this lot that I found particularly interesting was Grunt. If this was a Garrus/Zaeed/Legion collection I'd be on it like a leather jumpsuit on Miranda, but as it is... well, maybe.